You are currently browsing articles tagged Orthodox Presbyterian Church. Solomon wrote once that “a good name is to be chosen rather than great riches.” (Proverbs 22:1a ESV) And while this text speaks of one’s personal name, it could also have an application to the name of a denomination. What’s in a name, after all? That question was the issue in February, 1939 when the Presbyterian Church of America had to be renamed, just two and one half years after taking it up in 1936. The Presbyterian Church in the U.S.A. had taken the young denomination to court over the issue of its chosen name. That whole scene will be dealt with in a future historical devotional on April 28. When the PCUSA won the court case, the General Assembly of the PCofA decided not to contest the lower court decision. Calling a special meeting in the month of February, the question was simple. What do we call ourselves now? Many names were suggested by the teaching and ruling elders. Some of them were: Evangelical Presbyterian Church, Presbyterian and Reformed Church of America, North America Presbyterian Church, Presbyterian Church of Christ, Protestant Presbyterian Church of America, Seceding Presbyterian Church of America, and this contributor’s favorite, Free Presbyterian Church of the World! Oh yes, one other name was also suggested. It was the Orthodox Presbyterian Church. In the end, on this day, February 9, 1939, the name of Orthodox Presbyterian Church won over “Evangelical Presbyterian Church” by a close margin, but a winning margin. Certainly, each of the above suggested names meant something to the proponents of them, or they wouldn’t have been suggested in the first place. The choosing of the winning name spoke volumes about the orthodox or straight, right, and true convictions which led the men and women out of the apostate Presbyterian Church in the U.S.A. in the first place. Biblical orthodoxy would be the hallmark of the continuing church, as it had been back in 1936. The OPC is not alone in having to find a new name. The name originally chosen in 1973 for what was to become the Presbyterian Church in America (PCA) was the “National Presbyterian Church,” but seeking to avoid a conflict with the Washington, D.C. congregation of the same name, we wisely chose another name in 1974 and so came to be the PCA. Day Two of their Second General Assembly The following materials are drawn from the scrapbooks gathered by the Rev. 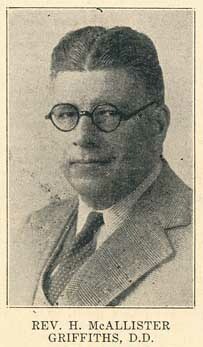 Henry G. Welbon. 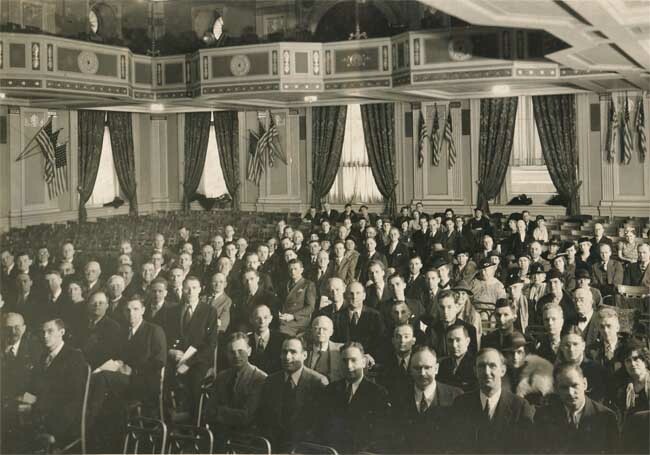 Initially organized as the Presbyterian Church of America, the denomination we now know as the Orthodox Presbyterian Church met in its second General Assembly, beginning on Thursday, November 12 and adjourned on Saturday, November 14, 1936. As the retiring moderator of the first Assembly, the Rev. J. Gresham Machen had opened the proceedings with a sermon on 2 Cor. 5:14-15, and the assembled delegates then celebrated the Lord’s Supper. The Rev. J. Oliver Buswell, Jr. and the Rev. 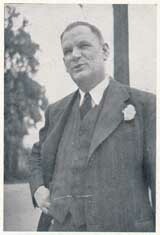 J. Burton Thwing were nominated for Moderator of the Second General Assembly, and Rev. Buswell was elected to serve, the Rev. 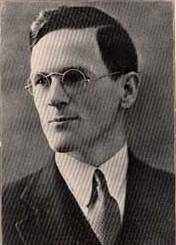 Cornelius Van Til and the Rev. Carl McIntire escorting Rev. Buswell to the platform. The election of Rev. Buswell as Moderator was, for one, seen as a way to minimize the possibility of friction over the issue of pre-millennialism, Buswell himself being a pre-millennialist. Ultimately that gambit did not succeed, and the young denomination suffered a split in 1938, with the formation of the overtly pre-millennial Bible Presbyterian Synod. Caption for the news clipping photo at right: At the left is Dr. J. Oliver Buswell, Jr., president of Wheaton College, who was elected at the opening business session of the second General Assembly of the Presbyterian Church of America here yesterday. 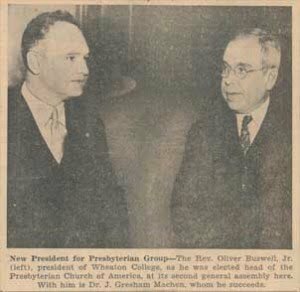 he succeeds Dr. J. Gresham Machen, of Philadelphia, show at the right, who was one of the leaders in the revolt of Fundamentalists from the Presbyterian Church in the U.S.A. The revolt let to the formation of the new church at the first General Assembly, June 11. Presbyterian of America Goes on Record Against Interlocking Committees. Members of the new denomination before its formation constantly asserted that the parent Church, the Presbyterian Church in the U.S.A., was controlled by an official clique. The resolutions were carried by a large majority. Another resolution calling for a staggering of appointments to committees so as to prevent self-perpetuation of the governing heads, was defeated, when it was pointed out that the organizers of the new church should be given a free hand to carry out their work without interruption. I recall that at a certain meeting of my presbytery, a candidate for the ministry was asked what he liked about the Presbyterian Church in America. 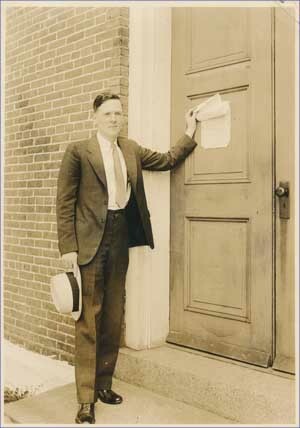 With this candidate having grown up in an independent church fellowship, his reply shocked all of us elders at its first sound when he replied, “our Book of Church Order!” What we groaned at, with its very specific ways of doing things, was the very thing he rejoiced in, finding a supply of godly guidelines with which to “do church.” Elder representatives at the above described General Assembly of the Presbyterian Church of America wanted to profit from the past, especially even from the negative examples of those liberal churchmen and apostate churches where biblical input had been strangled in past PCUSA church assemblies. So important rules were added to the constitution of their newly formed church. Once adopted into practice, the more important outreach of the church could be accomplished with God’s blessing. On August 3, 1936, newspapers in and around Wilmington, Delaware ran the following article covering the closure of the Head-of-Christiana Presbyterian Church, where the Rev. Henry G. Welbon was pastor at the time. Rev. H.G. Welbon Uses Own Key at Head-of-Christiana. Has Services in Spite of Ban. The Rev. Henry G. Welbon, fundamentalist pastor recently unfrocked by the Presbytery of New Castle for his refusal to bow to that body in the fundamentalist-modernist conflict, found himself locked out of Head-of-Christiana church when he went there yesterday to conduct Sunday services. After consulting an attorney, he opened his church with his own key and conducted services as usual, ignoring a notice that had been tacked on the door by four trustees forbidding the use of the building except with their permission. The notice was also signed by a committee of four established by the Presbytery to act as the church Session. The four trustees are a majority of the board who side with the Presbytery. The trustees acted to exercise their authority over the church property, now in dispute between Presbytery and the seceding group led at Head-of-Christiana by Mr. Welbon. “It is now up to this (seceding) group to prove their right of possession of the church and their right to enter it,” one of the four trustees said today. Mr. Welbon said he acted upon advice of his attorney in opening the church. His attorney, Mr. Welbon said, stated that so long as Mr. Welbon had the key he could not be locked out. The four trustees obtained a key which they believed to be the only one to the church, from the sexton’s home. Dating back to legal cases set down in the 19th-century, local church property in the PCUSA legally belonged to the PCUSA Presbyteryies Thus, when conservative Presbyterians left the PCUSA in the 1930’s, in almost every case they lost their church buildings. The loss of those buildings was a substantial setback, particularly in the midst of an economic depression. So this was one major reason for the slow initial growth of both the Orthodox Presbyterian Church and the Bible Presbyterian Church, as leaving congregations had to start over and finance new buildings. That in turn may have been one very pragmatic reason why more conservatives did not leave the denomination. By contrast, when the Presbyterian Church in America was formed in 1973, certain legal precedents had been established in the 1960s which allowed most of the leaving congregations to retain their property. So these PCA congregations were on a better footing to begin with, plus it can be argued that the economic times were better. There were substantial costs of leaving in both the ’30’s and the ’70’s, though the costs were somewhat different in each instance. The church is not a building. Not a physical building, anyway. The visible church consists of all those people and their children that have entered into a covenant with the one true God by way of His Son and the sacrifice that He paid on behalf of a chosen people. January 18: You Can’t Say That! The Rev. 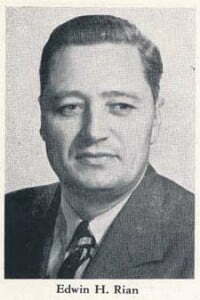 Henry G. Welbon was a founding member in 1936 of the denomination that later became known as the Orthodox Presbyterian Church. His own convictions led him to next affiliate with the Bible Presbyterian Church in 1938. Eventually he became a member of the PCA in 1982, when the PCA received the Reformed Presbyterian Church, Evangelical Synod. Rev. Welbon [pictured at right] had a keen appreciation for history and gathered seven notebooks of news clippings and articles covering the modernist controversy in the 1930’s. These are preserved at the PCA Historical Center as an important part of his papers. From among those clippings, there is the following, on how the Orthodox Presbyterian Church was forced in court to change the name that they had originally chosen, the Presbyterian Church of America. The fundamentalist group which split from the Presbyterian Church will have to find some other name than “Presbyterian Church of America,” President Judge Frank Smith ruled in Common Pleas Court No. 5 today. 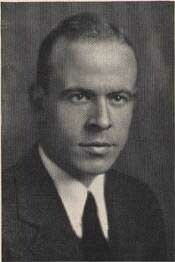 The fundamentalist organization was formed in Philadelphia on June 10, 1936, by the late Dr. J. Gresham Machen and a group of other clergymen and laymen. 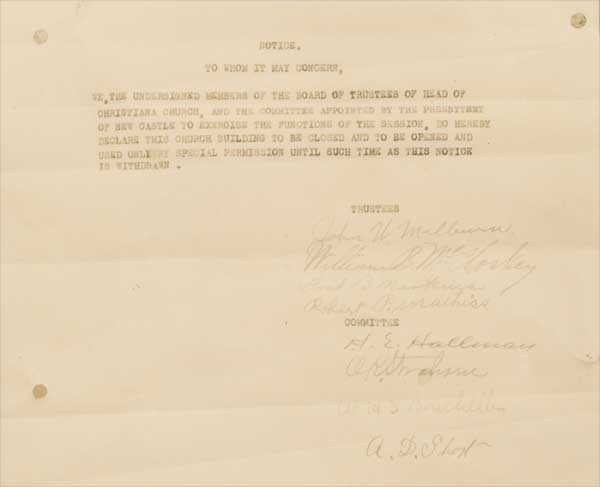 The group declared itself a “General Assembly,” with Dr. Machen as moderator and Dr. Paul Woolley as clerk. The name Presbyterian Church of America was adopted. The parent church countered with the court action, filed by the Rev. Henry B. Master, moderator, demanding that the “rebel” group be forbidden use of the name it selected. “It would be a serious hurt to the reputation of the plaintiff church and a detriment to its work if the defendant church, bearing a name identical or similar, should enter areas occupied by the plaintiff church in real competition with it, thereby destroying the faith of those individuals in foreign countries insufficiently versed in English to comprehend the controversy. The thoughtful reader may ask, Why then wasn’t a similar lawsuit brought against the Presbyterian Church in America (PCA), when it chose that name in 1974? It could only have been because the Presbyterian Church, U.S.A. had merged with the United Presbyterian Church of North America in 1958. A true merger legally creates a new entity, and they had chosen the name United Presbyterian Church in the United States of America (UPCUSA). That UPCUSA name was so different from Presbyterian Church in America that no similar lawsuit could be brought in the 1970’s. Denominations exist because Truth matters. We seek to know God’s will and to live accordingly. To that end, careful study brings us to certain convictions about what the Bible teaches. But we are sinful and know the Scriptures imperfectly, so our convictions may differ from those of other Christians. On the level of honest, studied differences, division among Christians is regrettable, but necessary, if our allegiance to Truth is to be upheld. Here we can amicably continue to work toward a better understanding of God’s Word and His will for our lives. But when is it right to divide or leave a denomination? The work of Scottish theologian James Durham is helpful at this point. In sum, he concluded that only when staying would mean having to participate in sin, only then is division appropriate and necessary. Another work on this subject, by the scholar John Macpherson, is available here and makes for fascinating reading. Note: Our Through the Scriptures and Through the Standards sections have now been replaced by RSS feeds which appear at the top of right-hand column, and also at the bottom of each blog page. There was also a declaration that those attempts to censure by the Presbyterian Church USA upon teaching and ruling elders than currently in the Presbyterian Church of America were “terminated, lifted, and declared at an end.” (Minutes. p. 13) Two presbyteries were erected by the General Assembly, that of Philadelphia, and New York and New England. With that, the first General Assembly of the Presbyterian Church of America was closed with prayer. WLC 92 — “What did God at first reveal unto man as the rule of his obedience? WSC 40 — “What did God at first reveal to man for the rule of his obedience?